EIA is now reporting data for individual states, including Alaska, that represented over 95% of total U.S. natural gas production in 2014. Previously, the survey's other states grouping combined natural gas production from 27 states and the Federal Offshore Pacific. 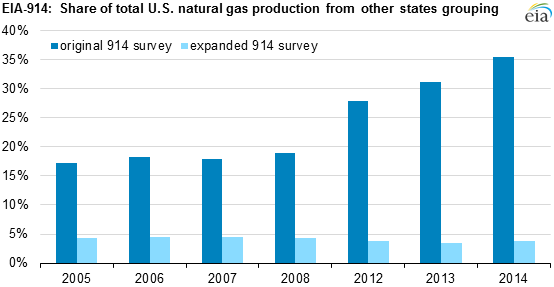 The previous grouping of states accounted for only 17% of total U.S. natural gas gross withdrawals in 2005. That share rose to more than a third (35%) by 2014. 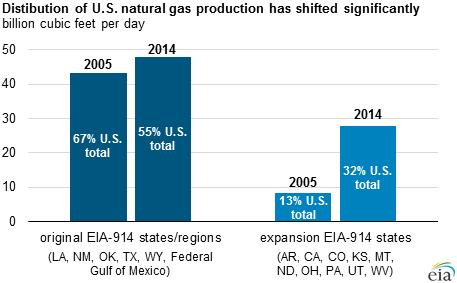 Within this group, the 10 expansion states represented 13% of total U.S. natural gas gross withdrawals in 2005 and more than twice that share (32%) in 2014. Production data from these 10 states will now be individually listed in the report. The remaining 18 states/areas that now make up the aggregated other states grouping (Alabama, Arizona, Florida, Illinois, Indiana, Kentucky, Maryland, Michigan, Mississippi, Missouri, Nebraska, Nevada, New York, Oregon, South Dakota, Tennessee, Virginia, and the federal Pacific) consistently accounted for less than 5% of U.S. natural gas production from 2005 through 2014. 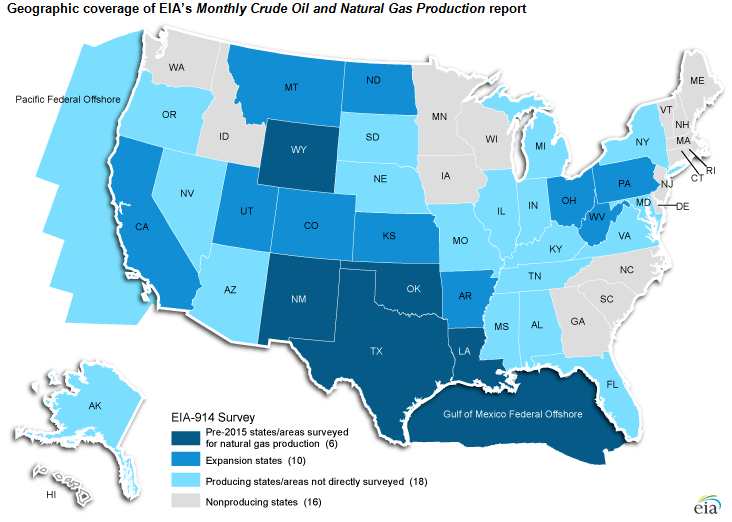 Natural gas production data collected on the EIA-914 survey are used as inputs to several EIA products, including the Natural Gas Monthly and EIA forecasts such as the Short-Term Energy Outlook and the Annual Energy Outlook. 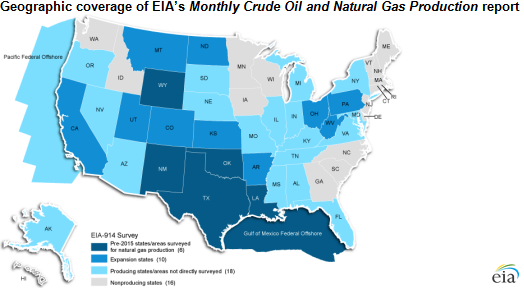 As suggested by the title of the new webpage, EIA will also be using the webpage to report survey-based estimates for monthly crude oil production (including lease condensate) from the states covered by the new EIA-914 survey later this summer, followed by production data categorized by API gravity, an important measure of crude oil quality.